Join us for this highly-anticipated work of art: The Letting of a Little Water by Shakirah Peterson. The Letting of a Little Water is a collection of magnetic poetry and polaroids. Each poem was either written to match the polaroid or the polaroid was taken to match the poem. The Letting of a Little Water is a visual example of being in tune with your emotions and being able to see yourself in the world around you. Shakirah Peterson was born and raised in South Central, Los Angeles. 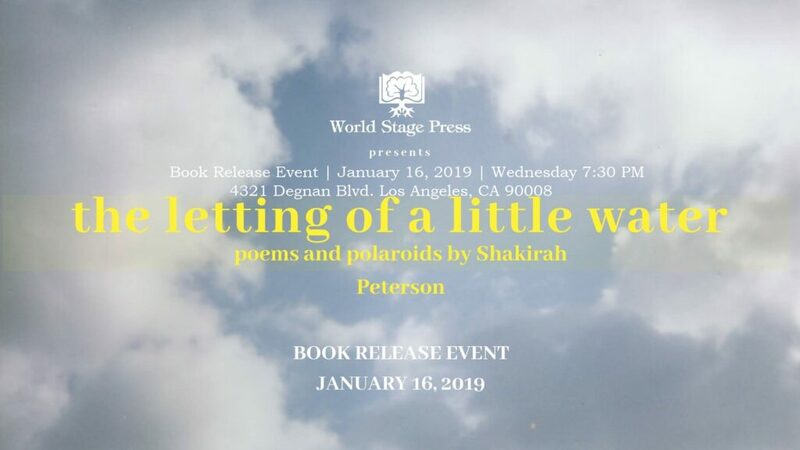 Her first collection of poetry and polaroids, The Letting of a Little Water, will be released in January 2019. Her poetry is an example of emotional intelligence; a literal and visual example of being in tune with how you feel. Her only wish is for her words to reach someone, who has a heavy heart that is filled with emotion, and to open up a window that allows them to let go. WHATEVER SHAKIRA PETERSON WRITES, I TRUST TO BE AUTHENTIC, AND AT THE VERY LEAST, I TRUST IT WILL BE GOOD. FROM THE MOMENT I HEARD HER WORK A FEW YEARS AGO, I KNOW THIS MUCH IS TRUE. IT WOULD BEHOOVE EVERYONE READING THIS COMMENT, TO ATTEND HER BOOK RELEASE ON JANUARY 16, 2019, AND WITNESS THE WONDER OF HER WORDS FOR YOURSELVES. YOU TOO, WILL THEN BE ABLE, TO TESTIFY!